Eliminate the cost and hassle of replacing broken backboards, bent rims and leaning poles. Even the roughest play in unsupervised parks and playgrounds will not take its toll on the LegendTM System. It's guaranteed. The massive 6-inch tubular steel pole system, rectangular 42-inch-by-72-inch steel backboard and heavy-duty double-rim goal all carry an unconditional lifetime warranty. Disc Golf is one of the best lifetime fitness sports. It is easy to learn, a healthy activity and accessible to people of all ages and fitness levels. Disc Golf courses can use a wide variety of terrain, most often land not suitable for other park activities or development is perfect terrain for a Disc Golf course. Disc Golf Association offers player-preferred course equipment and can provide the finest quality Disc Golf baskets and service. Future Pro has the Bison ShootOut portable aluminum soccer goals in three styles, with 4-inch square, 4-inch round or 2-inch-by-4-inch aluminum crossbars and corner posts. Sizes range from 24-foot official competition goals to 9-foot bantam size. All feature QwikTrack net attachment tracks, a rear stabilizer bar and a backstay design that virtually eliminates weld failures. Complete packages include two powder-coated goals, premium nets, built-in transport wheel kits and rear horizontal stabilizer bars, auger style hold downs and QwikTrack net attachment kits. The Monopole Batting Cage from Master Pitching Machine is easily distinguishable by its "tent top" design. It is built in six-, eight- and 10-stall units with a standard depth of 92 feet. From all areas within the cage, the concrete floor is sloped to a central point where an elevator picks up the balls and refeeds the machines. It features an enormous hitting area that lets batters see their hits fly above and beyond the machines. 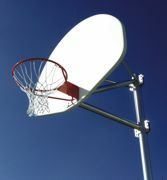 For over 50 years, L.A. Steelcraft Products' basketball backstops have withstood heavy-duty use in outdoor environments. L.A. Steelcraft systems feature upright posts of standard wall galvanized steel pipe (neatly capped for weather protection), twist-preventing, anti-rotational welded bars to posts below grade, and all extensions are 2 3/8-inch OD standard wall galvanized steel pipe. Straight or curved post combinations are available in various post sizes, as well as a variety of backboards and goal rims to choose from. FoldFast Goals is a leader in portable sports goals. Its mission is to enhance the quality of youth practice and competition with goals that are distinctive, durable, fun to use and, above all, simple to set up and store for league organizers and recreation managers. The goals set up in seconds. FoldFast's patented one-piece design means there are no pieces to lose, jam or pinch fingers. Each goal is constructed from a combination of high-performance plastic and steel. The new portable folding bleacher system from Pro-Bound Sports is a no-nonsense approach to bleacher design. It offers the customer exceptional features not often seen in this price range. S.A.T. (Spring Assist Technology) allows for compact folding by one person without the complexity of accordion-style bleachers. Each bleacher section comes in standard 12-foot lengths, with either five or six seat levels. Walk planks are doublewide to ensure firm footing. Multiple sections can be positioned end to end for larger events. A Pre-Fab Miniature Golf Course that can be used indoors and outdoors is a perfect added amenity for any recreational facility. These courses offer a low investment and are easy to set up and move. Theme Courses along with Glow-in-the-Dark Courses are also available.